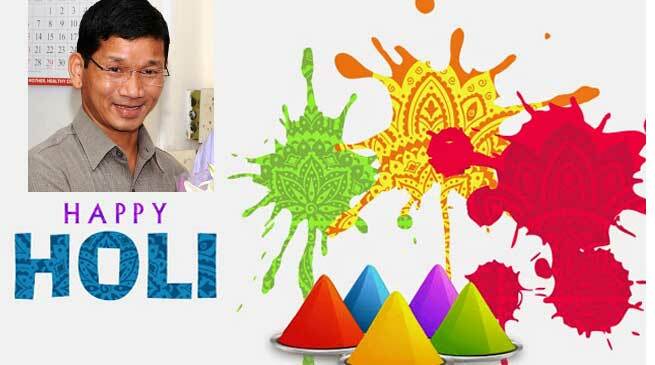 Chief Minister Kalikho Pul extended his heartiest greetings to the people of Arunachal Pradesh on the occasion of Holi. In his message to the people of Arunachal, the Chief Minister expressed that Holi comes at the onset of spring, which marks the spirit of rekindling of life – new leaves sprout on trees, the mustard flower is in full bloom and the garden and the parks present a riot of colour. Celebrated with gaiety and enthusiasm, the festival makes us forget our differences and spreads the message of brotherhood and friendship. Pul called to the people and said “Let us celebrate this colourful festival in its true spirit as Holi being the festival of colors, it’s the time to spend time with our loved ones and have fun playing with coloured powder, water balloons and sprinklers”. He also expressed ” it is the time to commemorate the victory of good over evil and to reach out with the colours of joy. It is also the time to love and forgive and the time to expresses the happiness of being loved and to be loved through colours”. In this festival of Colour, let us colour our heart with love for one another cutting across caste, creed and communities to make Arunachal and our country a colourful and beautiful place to live in.